Liberty Park is one of the nicest areas of Matanzas, with beautiful architecture, interesting museums and abundant trees for shade, its great place for people watching. 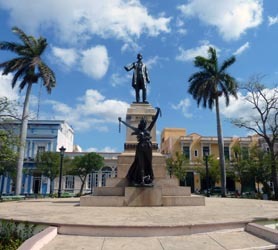 Just a few blocks directly west of Plaza de la Vigía you’ll discover Parque de La Libertad, within a few blocks of several more of Matanzas’ most interesting sights, including a 1909 bronze statue of José Martí which takes center stage of the Parque de La Libertad Matanzas. The park is also the bus stop for the Varadero Hop On – Hop Off Bus which visits Matanzas so if you are visiting Matanzas from Varadero you will invariably stop here. The Libertad Park is perfectly suited as a central point for your discovery of Matanzas, as most sights are within a few block of this central city square.